This has also given me the opportunity of describing my own development in so far as such a description is necessary to the understanding of the first as well as the second volume and to destroy the legendary fabrications which the Jewish Press have circulated about me. In this work I turn not to strangers but to those followers of the Movement whose hearts belong to it and who wish to study it more profoundly. I know that fewer people are won over by the written word than by the spoken word and that every great movement on this earth owes its growth to great speakers and not to great writers. Nevertheless, in order to produce more equality and uniformity in the defence of any doctrine, its fundamental principles must be committed to writing. May these two volumes therefore serve as the building stones which I contribute to the joint work. 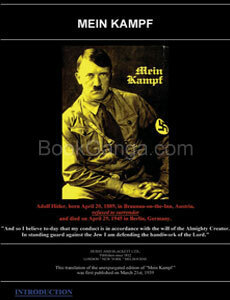 hello,have you provide mein kamf book in marathi plz reply.in my email account.thank you. One of the best Biography. hi, can you plz tell me how to download this book? मी माझ्या महाविद्यालयीन जीवनात हे पुस्तक वाचले होते. जबरदस्त. हिटलर काय चीज आहे ते कळला .